Be in the know about restaurant hood fire suppression systems! Use this checklist to ensure your restaurant fire suppression systems are compliant and that you are getting proper service from your fire protection contractor. You should be able to answer YES to all of the questions on this checklist. If not, you may not be getting what you've paid for or what is required by code. 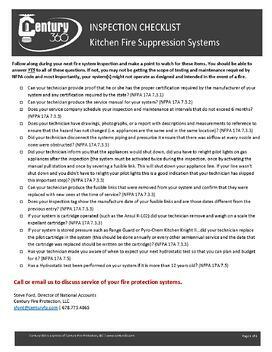 For more information on Kitchen Hood Fire Suppression Systems check out our blog.